How to get there: We used the trailhead serving Navajo Lake in Navajo Basin. We drove from Denver via US 285 to Poncha Springs, then US 50 to Gunnison and Monterose. From here follow the road towards Telluride, but turn right up to Lizard Head Pass a few miles before the town (Colorado Hwy 145). Drive 8.6 km down from Lizard Head Pass, then go right on a small dirt road, US Forest Service 535. This road is called Dunton Road, there is a sign. Follow this road up the side of the valley, then across an open flat area and finally descending down into a valley to the trailhead. There is a short, dead end road to the trailhead going sharply right near the bottom of the hill, this is 11.5 km from the beginning of Dunton Road. The trailhead has a good parking area. It took us 7.5 hours to drive from Denver including a quick lunch, gas, a few delays due to highway construction and a quick stop to buy some supplies in Monterose. The trail runs on the left side of Navajo Lake and then climbs into the Upper Navajo Basin. This climb, also on the left side (when ascending) of the valley, follows a very clear trail, mostly on rocks as it crosses a large rocky area on the slope. Higher up, the trail crosses a small creek and continues a more gradual climb into the very upper part of the basin. 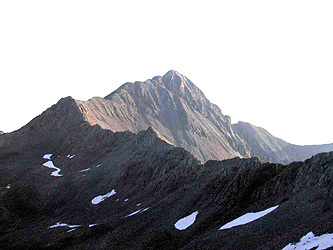 At this point one has Gladstone Peak straight ahead, Mount Wilson is up to the right (the summit cannot be seen), and Wilson Peak is behind a false summit that connects with a ridge to Gladstone Peak (left of Gladstone). The trail continues up to the very distinct pass between Navajo Basin and Silver Pick Basin. This pass is called Rock of Ages and is at 3970 m. Just before the pass, the trail visits the ruins of an old mine, there is an iron wagon (to be used in the mine) there. How this heavy object was moved here is almost beyond imagination. The trail to the pass is very clear and nice, the climb of Wilson Peak starts from this pass. From the pass, the route first follows the top of the ridge, then traverses in a gentle climb under the false summit that is looming overhead. The route is clearly marked with cairns and visible tracks from other climbers. The route reaches a small saddle on the ridge that extends from Wilson Peak to Gladstone Peak, there was a very visible pole at this point when we were there. From this point one can either downclimb (very easy class 2) on the other side of the ridge or follow cairns to the left, maintaining the elevation. This latter option involves some class 3 climbing on solid rock. Comments: I did this hike with Jan-Frode Myklebust. Wilson Peak and the connecting ridge in the direction of Gladstone Peak. 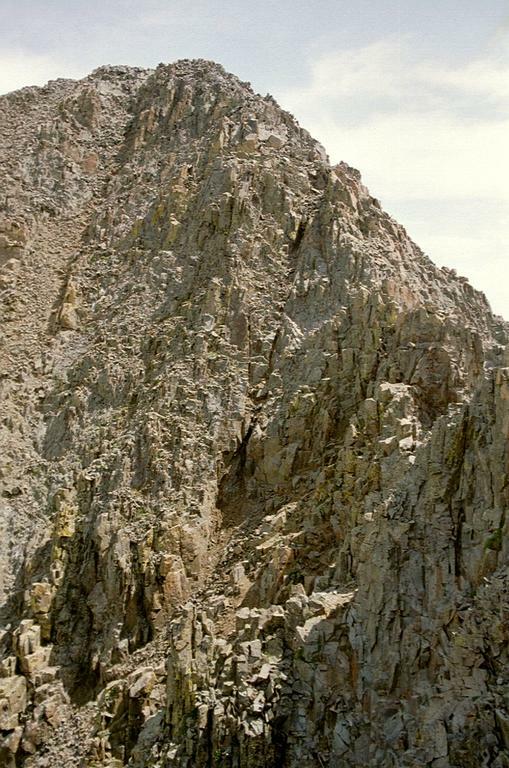 The route starts in the saddle in the leftmost part of the picture, traverses under the false summit, to the first, small col in the ridge quite near, but below this summit. From there the route gains access to the main face in the picture and ascents it towards a small false summit quite near the top. This picture is taken early in the morning while ascending Mount Wilson. 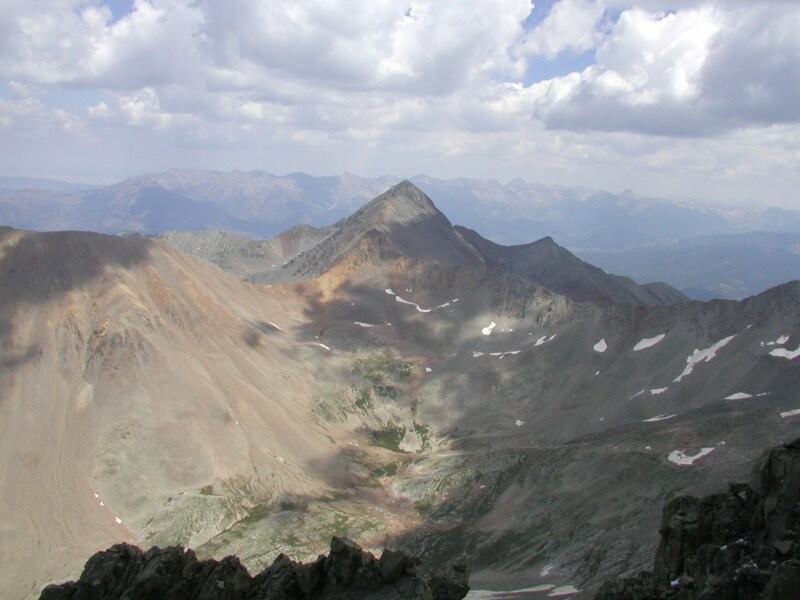 Wilson Peak and upper Navajo Basin as seen from the summit of El Diente. The crux on the Wilson Peak climb This picture may need to be scrolled. The easier route follows (on the right side) the distinct, narrow crack that starts in a brown, sand/gravel area and angels slightly right to hit the horizon ridge near a small, but distinct "dip" in the ridge. (This dip is about half way up on the visible part of the ridge in the picture.) From this point the route is easier and follows the main ridge to the summit.